A heart wrenching story of a child forced to lose his innocence. 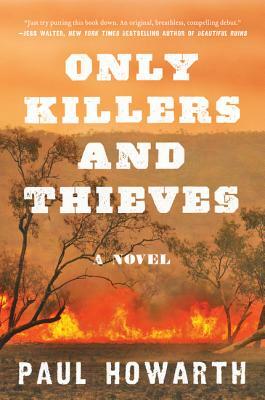 Set in the Australian outback in the years of settlement, Only Killers And Thieves is a brutal filleting of frontier life, race relations, and the ambition of men. The characters are unforgettable and the writing is effortless yet juicy. Such a great read. After their parents are murdered, two brothers join in the search for the killer with a fanatical inspector in the Native Police, whose authority-sanctioned mission is to exterminate a tribe of Aborigines in Australia in the 1880s. What begins as a quest for revenge soon degenerates into a coming-of-age nightmare for the two teenagers as they are drawn into a miasma of death and depravity. Written in prose as brutal and unsparing as the landscape in which it is set.